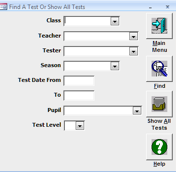 SCORZ contains an ‘Import Data’ tool that enables you to import your historical data from the previous CD version of the MICRA-T & SIGMA-T Computerised Scoring System. Before you access SCORZ, you need to decide whether it is desirable for you to import this historical data. CJ Fallon is only able to offer limited support for importing data and we have created the following guidance notes to help prepare your data. However, we do not guarantee that the data import tool will work in every instance and you need to check the data carefully before and after import. In preparation for exporting your data to SCORZ, it is advisable that you check your records in the MICRA-T & SIGMA-T Computerised Scoring System. To do this, click on Tests – Previous MICRA-T, Go and then Show All Tests. Using the Record counter on the bottom left of the screen you will see 1 of _ (the number of MICRA-T Tests recorded on the system). Click on the arrow highlighted below – this will bring you into your last MICRA-T test. Check the date of the Test – you now know how many MICRA-T tests you have and when the last test was administered and scored. Check SIGMA-T in the same way. 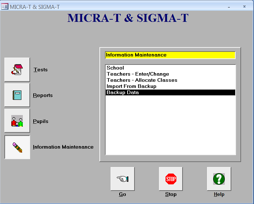 Each time you exit the MICRA-T and SIGMA-T Computerised Scoring System, your data is automatically backed up on the hard drive. Your data is stored in a folder called ‘Backups‘. If you accepted the suggested location when installing the system, this folder can be found in Program Files on the hard drive: C:\Program Files/MICRA-T. All backup files are automatically dated and saved in chronological order in the Backups folder. The backups folder holds the 10 most recent backups – anything older is saved in the Archive folder. Once you have created your backup successfully, you will be able to use the Import Data tool in SCORZ.